Sleaford Town are still searching for their first win of 2017 after falling to a third straight defeat at Kirby Muxloe on Saturday. Charlie Ward struck on the stroke of half-time with his third United Counties League goal of the campaign, but the visitors went down 3-1 to the fellow strugglers in Leicestershire. Kirby to closed to within a point of Town who remained in 18th, eight points clear of the bottom three, after their ninth away defeat of the season. On Saturday they face a tough test at fourth-placed Desborough who were narrow 3-2 winners at Eslaforde Park earlier this month. Town: L. Andersen, J. Braithwaite, S. Cann, B. Machin, P. McGann, H. Millard, R. Oliver, O. Price, J. Smith, C. Ward, D. Worthington. Subs: G. Asplin, N. Dongo, J. McMenemy. 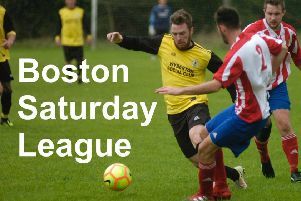 * Sleaford Sports Amateurs completed a quickfire Lincolnshire League double over Sleaford Town Reserves on Saturday with a 2-0 win at Eslaforde Park. Nathan Thompson gave the visitors the lead after 27 minutes and then sealed the points with a second with seven minutes to go. The victory, Amateurs’ fourth on the road this season, came just two weeks after a 4-2 win on their own patch and leapfrogged them above their town rivals into 10th spot. Amateurs host top five side Grimsby Borough Reserves on Saturday, while Town Reserves entertain Immingham. Both matches kick-off at 2pm.